Is Acer's Aspire 5560G the trail-blazing laptop we were expecting? Taiwanese giant Acer never sleeps, churning out more models than the X-Factor churns out z-list freakshows, but the majority are excellent devices that offer strong value for money. Sadly, the Aspire 5560G didn't tickle our sweet spot, due to under-performing features. At first glance, this is standard Acer fare. The plastic lid and interior features a dark grey finish, and while the Aspire 5560G isn't exactly a gorgeous machine, you won't have to carry it around in a brown paper bag either. Build quality is typically strong despite the plastic design, with no obvious weak spots. Acer's usual isolation-style keyboard is in place, and as comfortable to use as ever. The board stretches the entire width of the chassis, making it a great size with spacious keys. Keys are firmly mounted, which gives a solid typing action, and you even get a numeric keypad, which number-crunchers will love. The only irritants are the tiny arrow keys, which have been crushed into a single row. Movie buffs can watch the latest films in glorious High Definition on the widescreen 15.6-inch display. It's a reasonably bright screen with sharp contrast and deep blacks, while photos look pleasingly colourful. However, be prepared to fork out for some dedicated speakers if you want to enjoy music and movies at home, as the built-in pair are seriously underpowered. At least you can store your entire media collection on the 750GB hard drive, without resorting to external storage solutions – unless you're a fan of Torrents, of course. So far, so good. However, once you delve into the Aspire 5560G's innards, the fairytale ends. Many of Acer's laptops feature Intel's latest Sandy Bridge processors, which are powerful enough to run everything you throw at them, but this laptop opts for a less powerful AMD processor instead. The results are unsurprisingly disappointing. 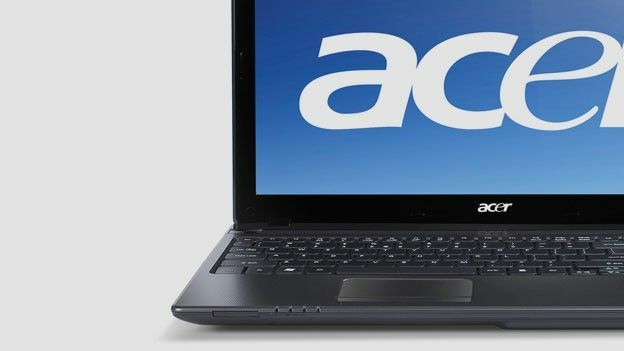 Compared to other Acer laptops such as the Aspire 5750, which costs over £200 less, the Aspire 5560G just can't keep up. It runs the latest office applications perfectly, and wirelessly browsing the web is a smooth experience thanks to the 802.11n Wi-Fi support. However, if you try to do too much at once you'll notice the occasional annoying lag. You do get a generous 8GB of memory, which helps when multi-tasking, but it feels wasted on a processor this clunky. The main selling point of this laptop is the graphics card, catchily named the AMD A8-3500M. This Dual Graphics AMD card is a combination of integrated and dedicated GPUs, which work together to render images, instead of functioning separately like nVidia's Optimus technology. It's a peculiar arrangement, but we had no trouble playing recent games in low to medium detail, while photo and video editing software also ran smoothly. However, we still prefer nVidia's portable GPUs, and can't imagine any gamers using this laptop as their everyday machine. If you're looking for a laptop to keep you productive away from home, the Aspire 5560G isn't ideal either. The 2.6kg chassis isn't too hefty to lug around, but the battery life lags behind rivals. managed around four hours of life if we limited ourselves to the most basic tasks, such as bashing out our latest Twilight rip-off screenplay. However, as soon as we kicked back with a film, battery life plunged to just two hours. Best limit yourself to short movies, instead of epics like Ben Hur. Features are standard for a mid-price laptop. VGA and HDMI connections can be used to hook up a television or monitor, if you want to watch a movie with the family or need a bigger screen for gaming. Three USB ports are available for attaching peripherals, while a 5-in-1 memory card reader can be used to exchange files with other portable devices. It's a shame the Aspire 5560G suffers from mediocre performance and pants battery life, given Acer's excellent track record. We'd have to recommend other mid-range laptops such as the Dell Inspiron 14z and the Lenovo Z570 instead. If you'd like an Acer laptop and aren't bothered about dedicated graphics, you'd be better off with one of Acer's cheaper Intel Sandy Bridge models, which offer strong performance at a more wallet-friendly price.